On December 15th, our graduates held a portfolio viewing at ACC’s Highland Campus. This reception featured work of Visual Communication students in Graphic Design. Industry professionals, fellow students, faculty, family and friends attended the event to celebrate the accomplishments of these students. 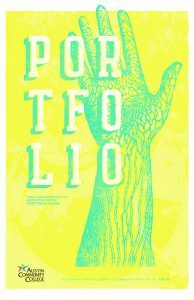 If you would like to see portfolios, you can see them here: Graduate Portfolio.